I can see why this popular corner cafe on Johnston Street is called Addict. With food and coffee as fine as this, there’s a reason why people keep coming back for more. 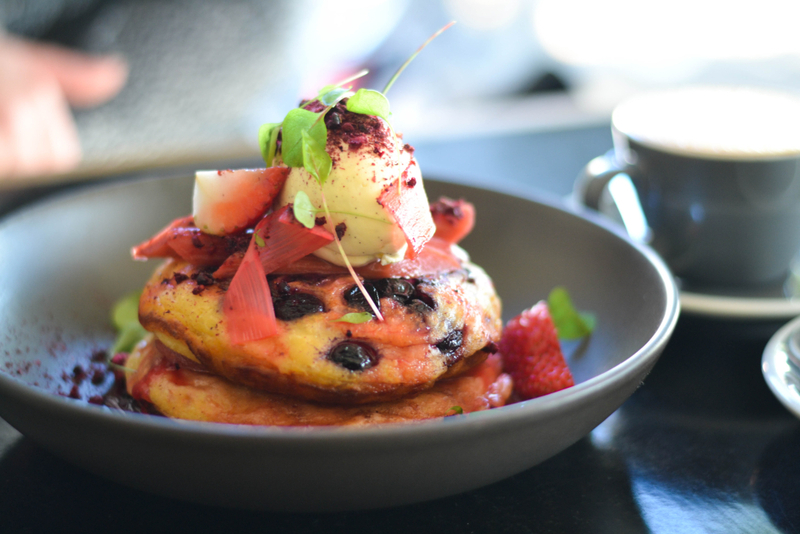 Nestled in the heart of Fitzroy, Addict Food & Coffee has developed a cult following amongst the locals (or not so locals) for their quality brunches and superb coffee. 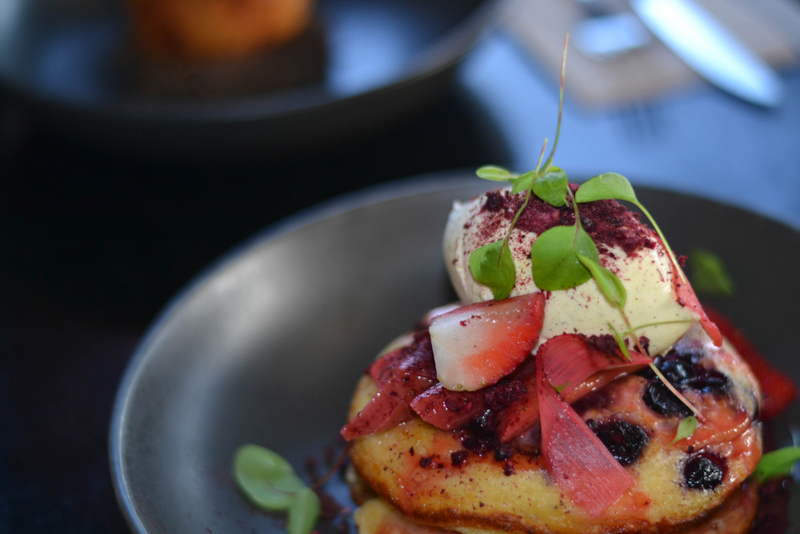 On a wintry Melbourne morning last week, I caught up for a brunch date with the lovely Roz from In Love with Brunch to find out what the fuss was all about. Upon entering Addict, you’re immediately greeted by a light and contemporary space. It’s cosy and intimate, yet doesn’t feel crowded. 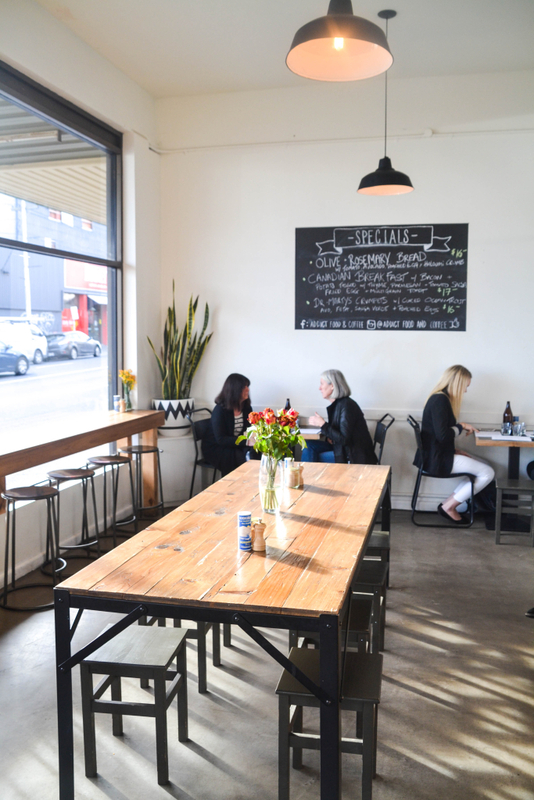 The sun drenched cafe has a nice mix of seating for singles and groups, and a large communal table in the heart of the action. There’s also a nice wrap around alfresco courtyard, which is hugely popular on summer days or if you’re bringing your furry friend along. 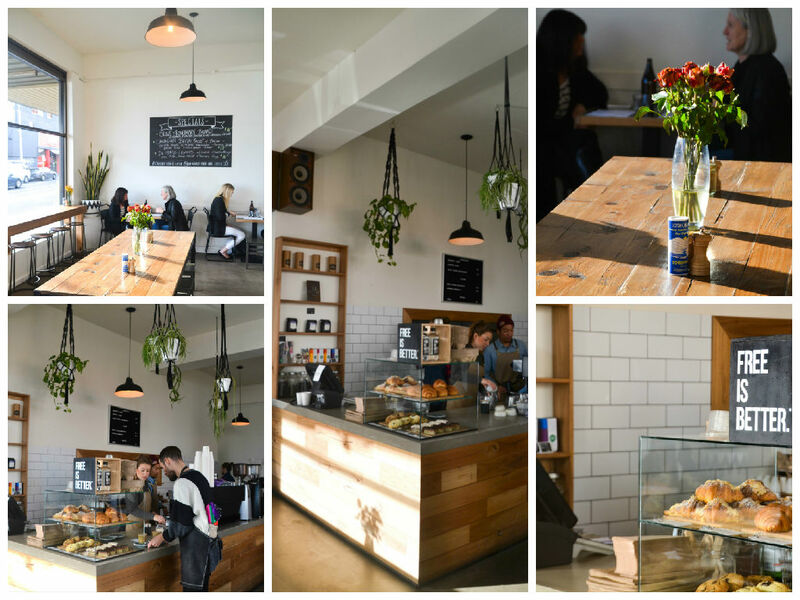 The blonde timber and minimalist design gives the cafe a semi Scandinavian feel. Polished concrete and stark white walls flanked with subway tiles are warmed up with vases of flowers and pot plants, strung up in macramé net which dangle precariously from the ceiling. The bar tables overlooking Johnston Street are a perfect spot to soak up some winter sunshine through the large window. A blonde panelled coffee bar takes centre stage, and is always stocked with sumptuous slices and freshly baked pastries if you’re looking for a quick takeaway option. On the menu there’s a great selection of breakfast and lunch classics which have been given a contemporary makeover. To tempt you further, a blackboard is updated daily, scrawled with the latest specials. On this occasion there’s Dr Marty Crumpets served with cured ocean trout, salsa verde and poached eggs and a devilishly good-looking Canadian breakfast. The coffee is exceptional here, offering a nice mix of house and single origin blends. On this occasion it’s Market Lane, one of my local favourites in Melbourne – a full-bodied and smooth blend just the way I like it. 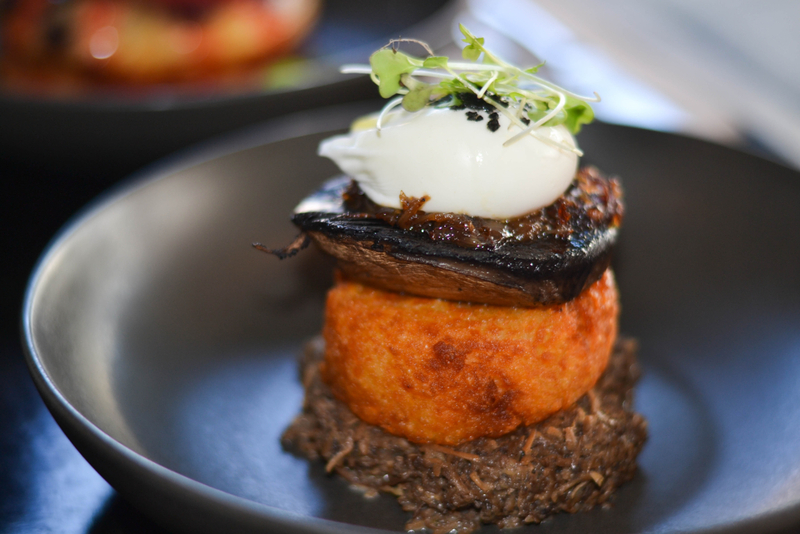 The potato hash is a handsome assembly, brilliantly executed in both flavour and texture. 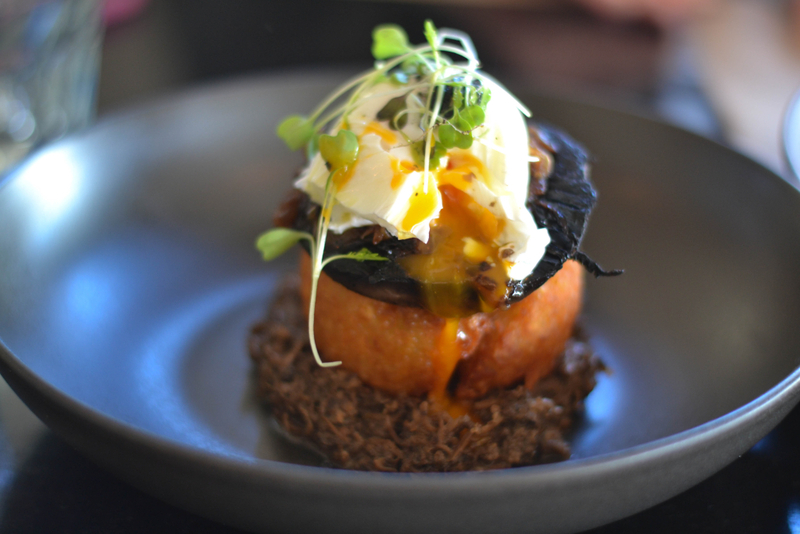 It may just be one of the best potato hashes I have had in Melbourne! Resting on a bed of mushroom duxelles (a delectable mixture of finely chopped mushrooms, shallots. herbs and a touch of garlic), the potato hash is by far the hero of the dish. It achieves an impossibly crispy golden crust – a delightful contrast to the fluffy soft potato within. The hash is crowned with a large field mushroom and caramelised onions which provide a touch of sweetness to offset the earthy flavours. The final element of the stack is a perfectly poached egg, the yolk of which drizzles unapologetically over the stack with the slightest nudge. 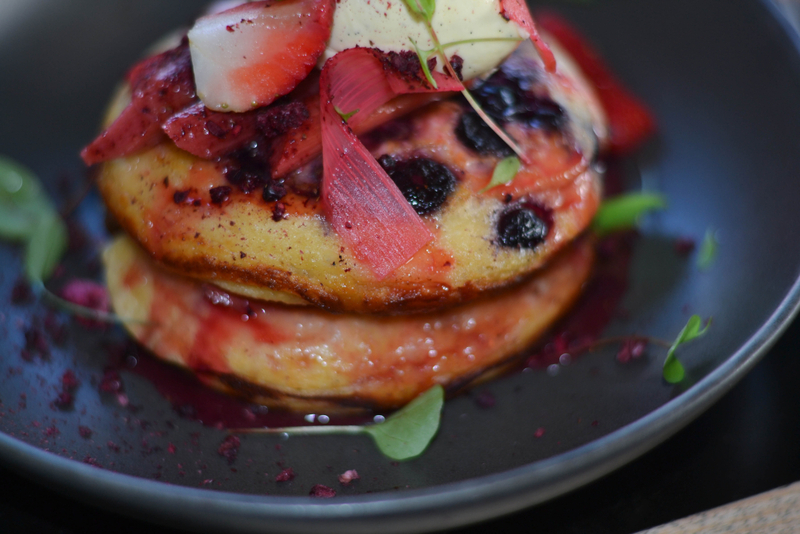 A picture perfect plate of wholemeal buttermilk pancakes were studded with juicy blueberries which literally popped on the tastebuds. The duo of pancakes were thick and fluffy, golden on the outside with a beautifully aerated centre. A medley of strawberries and poached rhubarb were teamed with a generous dollop of creamy mascarpone. 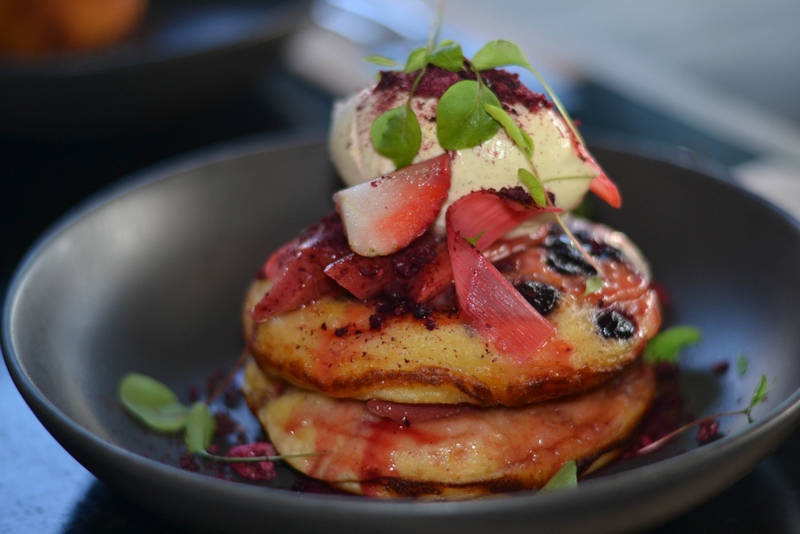 The sinfully sweet rhubarb syrup soaked through the pancakes effortlessly adding further moisture to the dish, while a dusting of compressed rhubarb achieved another great layer of textural complexity. It’s so hard to decide what to order at Addict; they have so many great looking options for both the savoury and sweet tooth. I can see myself becoming a regular at this local corner cafe.